Have 2006 SS/SC Transmission Rebuilt? So my donor is a 2006 SS/SC 5-speed car. The car was running and driving before I started tearing it down, and everything worked great. The question is, should I have the 5 speed (non-LSD) transmission rebuilt? Second question...should I add a LSD to is? Thoughts? Thanks! Andy, just a recommendation...I would call around to transmission shops and get a quote to freshen up the transmission and give you some data to assist with the decision. Mine was quoted at $2300 to rebuild and no local shop would go through it (I am in Dayton Ohio)...they sent it to a central rebuild facility in Louisville Kentucky. I was told from the transmission shop that GM parts availability for the F35 transmission were a major cost driver. Just a thought so you have data...thanks and good luck with your build ! Got it. I will call around to a few shops locally here in AZ and see what they say. Thanks. Being that's now a rear wheel drive setup, there isn't as much need for it to be a LSD. Personally, I would change the output shaft seals, new clutch and bearing, change the fluid, and drive it. If it was working fine and you aren't drag racing it, it should be fine. If you are throwing a ton of power at it and banging gears, yeah, then you might want to freshen it up or consider the F35 if/when they get the mounting finalized. The engine/transmission is easy to drop out of these cars and to make changes in the future should you need to. I think Chad meant to say F40 in the 3rd line of text in reference to the 'mounting finalized'. I researched getting a rebuilt LSD F35 trans with a few modest upgrades, but this was outside of my planned budget. I bought a brand new F40 transmission, new flywheel, new clutch and a new LSD for the same price (about $2300) as the base rebuilt F35 trans with LSD. You can read the 'F40 Transmission - Will It Work' posting under the Engine and Transmission section for more discussion. If a builder already has their frame, the F40 is no good to them, correct? Unless they want to mod themselves. And a F40 frame may be available in the future, correct? Just trying to get the facts straight. Kyle (Tinkles) is installing a F40 and he has taken deliverey of his frame already. He may be the person to talk to about the process he will be doing to get his F40 installed. Otherwise, I will be waiting to order my kit when DF announces the F40 mod is ready. I have looked into the F40...I really just want to stick with the F35. I don't want to go through the hassle to make it work. Yeah, I’m with you... I’m not a welder or a fabricator, so as much as I would like it to be, the F40 isn’t a viable option for me. F23 swap seems like a much better option, those transmission are dirt cheap and the frame is already set up for a F23. From what I've read, you need a custom flywheel 2.2/24 are 6 bolt crank flywheels 2.0 crank is 8 bolt, I believe a spacer somewhere, different shifter cables, im sure im missing a few other things, maybe different axles. I stopped researching and bought a 2nd F35 to have as a spare. If you look on www.car-part.com it shows junkyards around you and you can search for transmissions with limited slip "g85 option". Around me they run around 800-900 bucks with limited slip and I've seen some with pretty low miles. I will add it also depends on how you drive the car. I personally drive it like I stole it every time I get in it and without the lsd it wouldnt be fun. If you just plan on cruising you'd be fine but who makes one just to cruise around going slow everywhere Haha. Great site! Definitely nice to be able to look them up by specific transmission. Just a tip on that site. look at the bottom of the page where the page numbers are for the * That is the last page with a listed price. and it is usually the cheapest price. I always start there and work backwards. To be honest I'm not sure how you would know while driving that a goblin doesn't have a limited slip differential. We drove Adam's supercharged goblin with an F23 for 2 years and never got in a situation that you could tell that it did not have an LSD. If you dumped the clutch it always spun both tires. The only way you might get it to spin one tire is to start doing a tight circle and increase the throttle until it unloads the inside tire enough to spin it but it's tough to do. If you watch the videos of the All/Terrain it always spins both tires and it is a base model auto without an LSD. Looking like 4k plus for an F40/modified frame........buy 3 F35s for that price and still have money left over. Nothing says the F40 is better in this platform. I have a spare 4.05 LSD w/36k on it that I will just keep if I ever lose my 3.82 LSD trans. 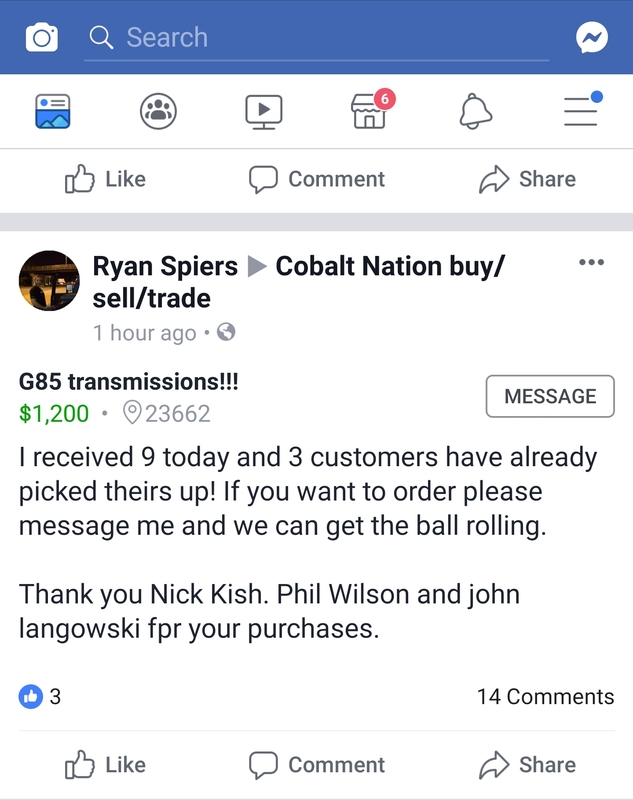 If anyone is interested a guy that works for a GM dealer on one of the facebook Cobalt groups is selling brand new G85 transmission for $1200. Yeah I saw that and considered it.